Egad. I don’t talk much about being away until we’re back, so apart from locals few people knew we were not in Colorado. Once it became clear that the fire was no quick or small matter, we got things in order as best we could and started the long trip west. We’ll be home some time tomorrow. Our house is about 11 miles SSE of the Waldo Canyon fire and does not appear to be in immediate danger. Jimi Henton is there with Aero and Jack, and we’re in regular touch with her. Over the last two days, the fire’s perimeters have moved mostly north and east. 30,000 people have been evacuated already (including several of our friends and even Michelle Malkin) and things are a stupendous mess. More than this I can’t tell you until we get there. Stand by. …for another 105 years. By 2117, I’ll be heavily involved in other pursuits and may not be able to watch–but man, did we get a show this time! Catching any short-lived astronomical phenomenon always involves a strong measure of luck. In 1972, seven friends and I drove 1200 miles to Cap Chat, Quebec, to see a total solar eclipse. We brought out the big guns–my 10″ telescope looks superficially like a big gun, and took a little explaining at customs both coming and going–but alas, two hours before totality the clouds rolled in. We had the novel experience of watching the umbra hurtling toward us by the darkening of the undersides of the high clouds, but of totality we saw nothing. Luck, yeah. While planning for the event I noticed that my sister Gretchen’s back yard has a near-optimum line-of-sight to the place on the NW horizon where the Sun would set on June 5, 2012. Her lot fronts on a large open space running roughly E-W, with high-tension lines and their towers the only significant obstruction. Given that my western horizon is a 9,800 foot mountain and I see granite up to about 35 degrees, Gretchen’s back yard seemed flukily ideal. So there we chose our ground. (Without hawks but with hounds–sort of–and elves be damned.) The instrument was my Bausch & Lomb Criterion 4000 suitcase scope, which has gone on a number of expeditions with us, including two total solar eclipses and Halley’s Comet in 1986. The technique was what I generally do for solar observing: project an image on a piece of foamcore supported by a separate tripod. The image at the top of this entry was a shot of the foamcore, taken with an ordinary and slightly ancient Kodak V530 pocket camera. I logged first contact at 5:05 PM. Second contact (when the trailing edge of the disk of Venus enters the disk of the Sun) came at 5:22 PM. After that it was the long slow crawl of Venus downward (on the foamcore) as the Sun slowly set in the northwest. Gretchen’s girls thought it was interesting, and before the transit I showed them how the telescope brings in a magnified but inverted image of things far away, like a 55-gallon trashcan across the open space. I’m sure they didn’t completely understand what was going on, but as with all Uncle Jeff tricks they did consider it a lot of fun. The weather was nothing short of astonishing: high 60s F, light breeze, crystal blue skies down to the horizon. So it had been the whole day, and so it stayed every minute until the Sun vanished behind some trees at 8:03 PM. I got a lot of good photos, considering that the photos were of an image projected on cardboard. Toward the end of visibility, the scope was directed square across the approach to O’Hare Field, and five, count ’em, five jet aircraft crossed the disk of the Sun while we watched. The exhaust from the engines, though invisible directly, distorted the solar image in an interesting way. Gretchen made one of her trademark pot roast feasts, with Yukon Gold mashed potatoes almost the color of the solar disk. (A dollop of real butter yellowed ’em up gorgeously.) Dash and QBit ran around in circles, chased balls, and slept like rocks last night. As did we all. Success just don’t get any more successful than that. We’re back and I’m ok; you can stop worrying about me now. (Nonetheless, many thanks for all the concerned emails.) We flew to Chicago to house-sit for Carol’s sister for a week or so, and most of what I did there was read books and visit family and a few old friends. My arm no longer hurts…much, and that only when I put significant weight or torque on it. I’m going to strength training tomorrow, a session I suspect will be interesting. In the meantime, I passed through my old neighborhood on the way to visit my kindergarten friend Art, and cruised down the street where I grew up, to see the house I lived in until I was 23. I was halfway down the block when it hit me: This is all wrong. I stopped where I knew my old house had been, and looked at something that was no longer my old house. In fact, it looked a lot like Dorothy’s tornado had dropped somebody else’s house on top of the house of my birth and somehow got the alignment right. It was a fairly common design, by the well-known Chicago developer Maclennan, and there were lots of them in our neighborhood. The original floor plan was just 900 square feet, with only two bedrooms and one bath. When my sister came along in 1956 my parents put a floor under the cathedral ceiling and made a third bedroom out of it, with a new dormer for a half bath upstairs. Shortly after that, they put a good-sized family room off the back side of the house that ran the full width of the structure. The family room included a brick fireplace with its own chimney. It was a little tight (especially by today’s standards) but I finished the basement in knotty pine when I was 15 and after establishing my desk and workbench there spent a great deal of my time downstairs. My mother lived there for 47 years, and when we sold the house in 1996 I figured that somebody would put some work into it. Whew. Was I right or what? It looks like they literally shaved off the second story and the family room completely, or possibly gutted the place down to the brick walls and started over. (I’m guessing my knotty pine walls in the basement did not make the cut either.) The house as it is today looks a little topheavy, but the lot is only 35 feet wide, and it takes some creativity to maximize the useful space buildable on that little land. No hard feelings, though forgive me for thinking that it just looks funny. The most striking change was the removal of both chimneys, which made me sigh because my first ham radio antenna was 30′ of #22 wire strung from one chimney to the other. I worked 34 states from that house (on a hacked-up Knight T-60) and saw eight planets from the front lawn. It was, let’s say, formative. Much more to talk about. I’ll try and catch up in coming days. I have a new desktop machine here, having scragged the old one by touching it before grounding myself. When you see a quarter-inch spark jump from your finger to a USB port, you know that nothing good is about to happen. I have a sketch for a steampunk discharge station coming together, with a 5″ bronze gear and a VR-75 gas regulator tube for visual effects. Touch your quadcore before touching the discharge station, and it’s back to your Babbage barn, bunky! So. Once again we rebooted the calendar, and it worked. Whew. Couldn’t have happened soon enough. This year had its moments, but it wasn’t among the best I can recall, though it stands shoulders above 2002. The year began with the worst flu I’ve had in 35 years. Lesson: Get your flu shots! Carol did. I didn’t. Q.E.D. There was other illness in the family that I won’t talk about, though nothing life-threatening. For that we have to move out into our friendscape. We lost Prudy Stewart, a stalwart from the local Bichon Frise Club, along with Harold Shippey, a gentleman in our camping group. Two of my grade school teachers died within a couple of months of one another: Mrs. Mary Clare Toffenetti, who taught art and French at IC school, and Mrs. Mary Veronica Condon, who taught third grade and also French. Dan Matthews, one of the kids in my grade school class, who had been a close friend for several years, died on Christmas Day. Just last night, one of our parishioners, who generally sat two pews behind us at church, had a serious heart attack. He’s in a coma and is not expected to survive. All this since November 1, sheesh. Oh, and my house almost blew up. Settling soil has been our bane here for years now. We had to empty the lower level and get the slab mudjacked, and are still fooling with paint chips and carpet samples now that the carpet’s been torn up anyway. All of my SF and most of my electronics magazines are packed and out of reach. It’s a mess. For good things to report I’ll begin with the completion of Drumlin Circus, a 53,000 word short novel that came together in one furious six-week period, during which I wrote as much as 5,000 words in a single day. 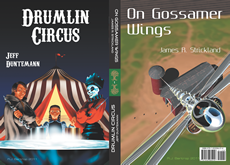 Jim Strickland and I put a tete-beche double novel on the market, incorporating Drumlin Circus and On Gossamer Wings, both tales from the Drumlins World. Jim and I attended the Taos Toolbox writers’ workshop in July, conducted by Walter Jon Williams and taught by Walter and my SF mentor Nancy Kress. I described the workshop in two entries after we got back, and would have continued if my damned gas line hadn’t threatened to ignite virtually under my feet. (I hope to write a little more about the workshop in coming days.) I will say right now that if you have a little experience in SF or fantasy, Taos Toolbox is spectacular. Granted, it’s expensive, and almost unbelievably intense. Jim describes it as a 500-level graduate course in the art of the novel compressed into two weeks, and that sounds about right. Walter is currently accepting applications for the 2012 workshop, and I give it my wholehearted recommendation. I met a lot of wonderful people, workshopped 15,000 words of my current novel-in-progress, Ten Gentle Opportunities, and returned with new dedication to the craft of fiction. I’d hoped to finish TGO by the end of the year, but (as described above) the year did not cooperate. The new target is April 1. Snotty AIs, zombies dancing the Macarena, a copier factory gone rogue, magic as software, physics as alternate magic, and malware from another universe…hey, what else d’ya want? On October 2, Carol and I celebrated our 35th wedding anniversary. We spent ten days on Oahu, generating enough gumption to start having the lower level rehabbed when we got back. It took everything we could generate, and more. I joined the Writers Write! group here locally, and have made many friends there. The group’s motto is Just write the damn book! It’s advice I need to take. Those are the broad strokes. Scattered among the days were little flashes of light and minor grunts of annoyance. My brakes have needed work three times. I met Cynthia Felice. My new superregenerative FM receiver has dead spots. I finished a nice steampunk computer table. That sort of thing; up and down on an almost daily basis. Happy new year, everyone. Strive to appreciate your friends this year. (You won’t have them forever!) Write more. Worry less. Go outside and check your gas pipes. Eat fat and drink sweet wine, and make sure you share what you have with others. I’ll be here when you need me. Christmas in Chicago is always aerobic, and this is the first chance I’ve had to sit down and gather impressions, now that we’re packed and ready to hop a plane. In seven short days I chauffered, shopped, entertained small girls, repaired a planter that needed deck screws and Plastic Wood, fixed computer problems, wrapped innumerable presents, unwrapped (different) innumerable presents, and ate far, far too much sugar. First bit of advice? Don’t mess with small white dogs. The Pack has been with Jimi this trip, but Carol’s sister Kathy has a ten-pound Maltese, and Wrigley received two dog toys for Christmas. One was a stuffed squeaky dinosaur that was all but guaranteed by its maker to be unshreddable by dogs. The other was a Christmas Kong snowman toy made of the same stuff that luggage straps are made of, and certainly looked like nothing short of a machete would take it down. Ha! I use the word “was” deliberately and with emphasis. It took Wrigley less than 24 hours to chew the squeaker out of the unshreddable dino, leaving a hole that suggested an alien bursting its way out from the vicinity of the poor thing’s kidneys. The Kong snowman lasted a little longer, but 36 hours post-Christmas, its squeaky plastic core lay exposed, and Carol had to remove its innards to keep Wrigley from swallowing them. We did a lot of visiting and probably more eating than we should have. On the way to see our nephew Matt’s flashy new apartment, I drove past my high school (Lane Tech) for the first time in over twenty years. The building itself hasn’t changed since I graduated in 1970, but the neighborhood is now almost unrecognizable. The “tech supply” stores where we bought drafting paper and bow compasses are gone, perhaps because Lane is less technical than it used to be, or perhaps because French curves are now draggable splines in a CAD document. The legendary Riverview amusement park (behind Lane Tech and still in operation until my sophomore year) is now a drab retail center. Sic transit, and all that. Transit? Uggh. The weather was hideous (clearly due to anthropogenic global whining, or perhaps unsustainable xenon dioxide emissions) and I had a rental car peculiarly unsuited to snow and ice: a lumbering Nissan Altima with rear wheel drive, grabby brakes, and a keyless key fob with an un-guarded panic button that will go off if left in your pocket with anything stiffer than a glob of rice pudding. My nieces gave me a Pillow Pet shaped like a penguin, which I suspect will be useful for leaning on while I mark up manuscripts, or simply as a laptop cushion for a lap that doesn’t have much inherent cushioning. I can see it parked on the back of my big reading chair, staring down at QBit, but therein lies some danger: QBit, like Mr. Byte before him, doesn’t like artifacts with eyes, and we’re going to have to be careful that he doesn’t drag the plush creature off to his lair to shred at leisure. (At least the penguin doesn’t have a squeaker.) Like I said, don’t mess with small white dogs. It was abundantly good to see family again, and partake of vigilia on Christmas Eve with my sister, Bill, and her girls, complete with piles of pierogi and Manischewitz sweet wine, just like we did it in the Sixties. Christmas Day at Kathy’s brought us cookies, key lime pie, ham, Hawaiian salad, potato bake, bean salad (which I heard was very good) apple and pecan pie, and much more. It’s a little late, but better late than never, and no less sincere for that: Merry Christmas to you and yours from Carol and me and the Pack. There’s much to be said and done in the coming year, if we can get past this bruiser of a winter and remember what really matters: freedom, family, and friendship. I’ll give it my best shot if you’ll give it yours! I put Carol on a plane Thursday morning for Chicago, after her mom was taken to the hospital late Tuesday night. Delores is doing a lot better now, but for a few days it was unclear just what was going on. We were both planning on flying out there on the 16th, so this wasn’t an immense change in our summer plans–it just means I’m here by myself for a bit, trying not to eat like a bachelor nor dress like a college student. When Carol’s gone, I generally drown my sorrows by writing, but I ran into an interesting problem yesterday. I finished Chapter 7 of Old Catholics last week. I won’t know how good it is until I get a month’s emotional distance from it, but in the meantime there’s Chapter 8. The problem came in when I sat down to write, me in my shorts with an iced tea on the coaster, the sun beating down on the oaks outside my window, only to realize that Chapter 8 is the Christmas chapter. It’s about the quirky Polish Christmas vigil supper at St. JJ’s, and draws heavily on my own experiences with Polish Christmas vigil suppers, both quirky and ordinary. It was 86 degrees out yesterday afternoon, and no matter what I did, I just could not get my interior state to feel like Christmas. It may be the mark of a true hack to be able to write convincingly about Christmas during the second week of July, but I may need to go back to hack school. I just can’t do it. No matter. I’ve been working on Old Catholics since 2005; what’s another five or six months’ delay? In the meantime, there’s “Drumlin Circus” to work on. It’s still at the notes-and-outline stage, but that doesn’t mean progress isn’t being made. Imagine a line of circus wagons pulled by woolly mammoths, and a show with an acrobat who performs in a cage with two live smilodons. (I may even work in a giant beaver.) And every artifact the circus owns; wagons, props, steam calliope, everything, is made out of drumlins. The Bitspace Institute kidnaps the circus master’s wife, who supposedly has a private drumlin that compels wild animals to obey her. After two years without her, the circus master finds out where the Institute is keeping her, and let’s say that he has a grudge. When the circus comes to a nearby town, it mounts a show that no one in town–especially the Institute–will ever forget. Pleistocene megafauna, scary clowns, calliope music, secret drumlins, the legendary Function Controller–we’re gonna have a real good time! It may be as much as 35,000 words long. Jim Strickland is doing a Drumlins novella as well, and we may try to put the two stories together as the first Copperwood Double. I’m not an ace at tete-beche, but I intend to learn. Stay tuned.